Here you will find all the latest news on the KW Kölner Weihnachtsgesellschaft mbH, as well as further links for downloading press releases, logos and images. You can find press images and more here. 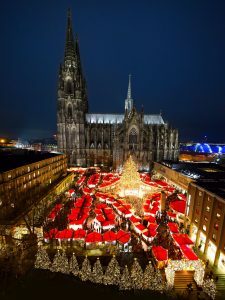 You can use the press releases, logos and images for your article about the Christmas Market at the Cologne Cathedral. The images are only free for the use of the press, their use for commercial purposes or distribution is not permitted. The source of the picture credits as: www.koelnerweihnachtsmarkt.com must be clearly visible with every use.